Our first ski trip of the year was to Purgatory Ski Area, which was planned by Ron Salley & Tonya Bush. Lodging was at the Best Western in Durango - only a short walk to restaurants & shopping. It was a snowy but fun weekend! Created on 14/03/19, last changed on 14/03/19. 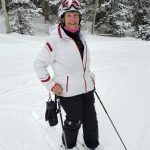 Wonderful skiing at Crested Butte again! Our stay at the cozy Old Town Inn in the town is always great! This fun trip was planned by Reg Rider & Jack Menako. 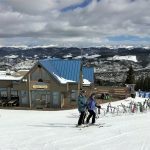 Another fun ski trip, skiing both Breckenridge & Keystone, planned by Karen Brown & Sherri Jackson! Our stay at the Doubletree by Hilton on the slopes of Peak 9 is just a short walk to the slopes. Created on 14/03/19, last changed on 18/03/19. 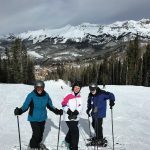 A great ski trip to Telluride planned by Helena Strati, Jim Eddings & Jack Menako. Fantastic conditions & weather!! 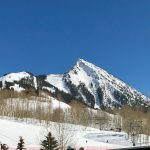 We always enjoy our stay at the Victorian Inn, located in the historic town of Telluride - it is just also just a couple blocks' walk to the Gondola. 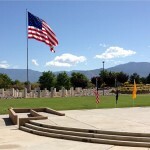 A nice turnout of ~40 MOAA members enjoyed beer, brats, and more at the New Mexico Veterans Memorial on a beautiful day. Chuck Wood directed numerous volunteers who helped put on this event. President, Walter Paul, presented donations to Blue Star Mothers, Gold Star Mothers and Veterans Integration Center from the Chapter. The College Scholarship was also presented for Kyla Cantergiani (granddaughter of Joyce & Joe Cantergiani). 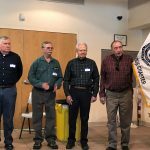 There was also elections & Installation of new officers. Created on 05/11/18, last changed on 14/03/19. 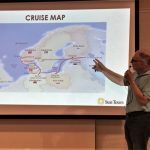 A nice turnout for Sun Tours explanation by owner, Frank Fines, on upcoming tours planned for MOAA in 2019: Asheville & the Smokies (May 15-20, 2019) and Scandinavia Baltic Cruise (August 28-September 12, 2019). All enjoyed the great food that everyone brought to share. Created on 10/06/18, last changed on 10/06/18. 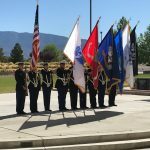 MOAA's Annual Memorial Service in memory of the deceased members and spouses was held at the beautiful NM Veterans Memorial. It was a beautiful morning! CDR Michael Cochrane, USN Ret (2nd Vice President, Albuquerque Chapter, MOAA) welcomed everyone. The Presentation of Colors was done by APS Joint JROTC Color Guard, followed by Pledge of Allegiance & soloist singing The National Athem. The 377 ABW Chaplain gave Opening Prayer & Memorial Address. COL Roger Knight & Maj Bob Rider read names of deceased. A Bagpipe Lament "Flowers in the Forest" was played by Capt ET McBridge. In conclusion, TAPS were played. It was a very moving service. A Social with refreshments followed the Memorial. Created on 03/06/18, last changed on 03/06/18. 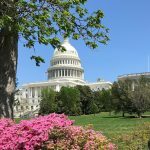 A wonderful, educational trip of Washington DC, planned by Sun Tours & Guided by Clay Benard. Created on 02/06/18, last changed on 02/06/18. Another great ski trip planned by Reg Rider & Jack Menako. 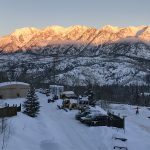 The weather was single digit cold - 4 inches of new snow the second night improved snow conditions considerably! The 3rd day was the favorite with new snow & sunshine. Created on 18/03/18, last changed on 18/03/18. A great trip to Telluride planned by Helena Strati, Karen Brown & Jim Eddings. 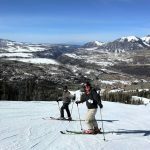 In spite of lack of snow this season, Telluride did a great job of covering the ski slopes! Beautiful weather!! Created on 17/03/18, last changed on 17/03/18. 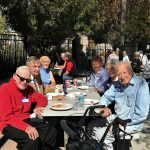 October 1, 2017 - MOAA's Membership Appreciation Meeting, serving "Beer & Brats"
A great turnout of ~100 MOAA members enjoyed beer, brats, and more at the New Mexico Veterans Memorial on a beautiful day. Chuck Wood directed numerous volunteers who helped put on this event. President, Walter Paul, presented donations to Blue Star Mothers, Gold Star Mothers and Veterans Integration Center. The College Scholarship was also presented for Anna Turner (granddaughter of Karen Brown). Created on 13/11/17, last changed on 13/11/17. 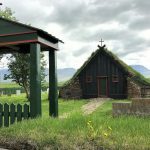 Iceland was born through volcanic action. The resulting land of peaks, geysers, glaciers, waterfalls, lakes and astonishing scenery is breath-taking. Here nature is unspoiled by pollution or development. 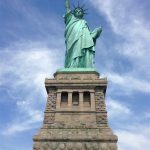 This definitive tour circles the island to see all the best sights at the season of maximum daylight. Created on 01/07/17, last changed on 02/07/17. 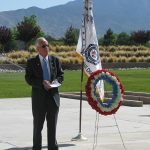 MOAA's Annual Memorial Service in memory of the deceased members and spouses was held at the beautiful NM Veterans Memorial. It was a beautiful morning! CDR Michael Cochrane, USN Ret (2nd Vice President, Albuquerque Chapter, MOAA) welcomed everyone & lead Pledge of Allegiance. 377 ABW Chaplain gave opening prayer & Memorial Address. COL Roger Knight read names of deceased. The 47th NM Regiment performed a gun salute, which was followed by a Bagpipe Lament (Mike Henry & Molly Kearney). It was a very moving service. A Social with refreshments followed the Memorial. Created on 09/05/17, last changed on 09/05/17. 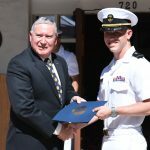 CDR Michael Cochrane, USN (Ret), presenting Midshipman Second Class Bret Williams the MOAA ROTC Medal, a certificate and $800 Award at the UNM awards ceremony on May 4, 2017. 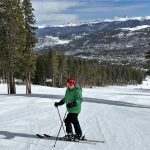 Great skiing at both Breckenridge & Keystone with lodging at the Doubletree by Hilton at Breckenridge (on the slopes), planned by Karen Brown & Tom & Phyllis Popp. Lots of powder again, so fantastic skiing! Created on 14/03/17, last changed on 14/03/17. 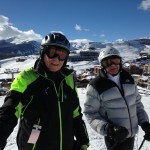 Another fantastic Purgatory Ski Trip, planned by Phil Vitale & Ron Salley. There was new snow daily! Accommodations were at the Best Western Rio Grande Inn in Durango. Created on 14/01/17, last changed on 14/01/17. 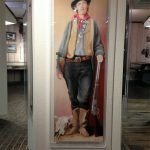 A wonderful 3-day trip to Alamosa enjoyed by 40 participants, which included a full day train ride on the Rio Grande Scenic Railroad with lunch plus visits to San Luis Valley Museum, Fort Garland, Millicent Rogers Museum and Taos Plaza. We also had dinner stops at Ninos Restaurant in Alamosa, CO and El Paragua Restaurant in Espanola, NM. Created on 29/12/16, last changed on 29/12/16. We are sad to announce that Col Roger W Mickelson, USA (Ret) passed away on November 26, 2016, as a result of an automobile accident. Roger was a Past President of the Albuquerque Chapter, MOAA, a board member of the MG John S. Lekson Chapter of the Association of the United States Army and an active member of the New Mexico Military Council of Chapters and was very active in the monitoring of both state and national legislature. He will be missed by all! Created on 02/12/16, last changed on 11/12/16. Another great trip planned by Sun Tours & guided by Clay Bernard! Created on 06/11/16, last changed on 08/11/16. Created on 25/07/16, last changed on 25/07/16. An enjoyable, educational 2-day trip with guided tours in Fort Stanton and Lincoln Historical Parks plus a delicious dinner & fun performance by PAPA DO RUN RUN (one of California’s legendary “beach party” bands). Created on 24/07/16, last changed on 17/11/16. Created on 06/05/16, last changed on 30/06/16. 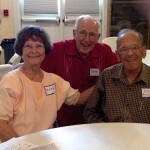 There were ~60 participants at our August Ski Club meeting, where we enjoyed good food & socializing. Trip Chairs were there to sign up folks for upcoming ski trips. Created on 26/04/16, last changed on 25/07/16. 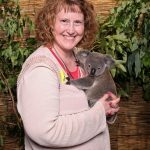 A wonderful trip planned by Sun Tours. Sights included Niagara Falls, VIA Canadian train right from Toronto to Vancouver - only downfall was that the train was late! We had 3 days in Canadian Rockies, staying at Jasper & Banff, visiting Athabasca Glacier & falls, Lake Louise, Sunwapta Falls, Peyto Lake and more. 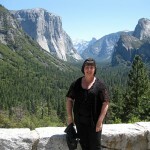 From Vancouver, we ferried over to Vancouver Island to see beautiful Butchart Gardens & Victoria. We had a great participation of ~75 MOAA members who brought delicious hors d'oeuvres for our annual MOAA Tours Party at the NM Veterans Memorial. We all enjoyed socializing and hearing Karl Storch (Sun Tours President) tell us about the 2016 trips planned for MOAA Tours: Australia/New Zealand (March 14-30, 2016) & New York City - Deluxe Theater Tour (August 22-28, 2016). 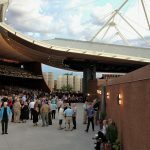 This tour included coach transportation, 1 night at Quality Inn, Page, AZ; 1 night at Bryce Canyon (motel); UT and 2 nights at North Rim Grand Canyon (Frontier cabins), AZ. On the way we stopped at Navajo National Monument. 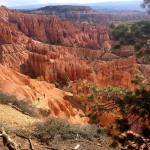 We had guided tours of Antelope Canyon(near Page) and step-on guides at both Bryce Canyon and North Rim Grand Canyon. The weather was perfect & a great time was had by 41 participants. 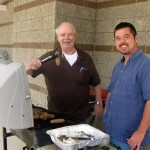 To celebrate a successful ski season, a Barbeque Buffet from Powdrell's was set up at the NM Veterans Memorial, Free to 2014-2015 paid-up MOAA Ski Club members. It was a very nice social, followed by birthday cake, in honor of Fred Brown's 75th birthday. Fred Green also celebrates his birthday this month. 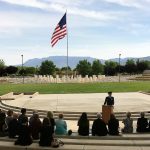 MOAA's Annual Memorial Service in memory of the deceased members and spouses was held at the beautiful NM Veterans Memorial. It was a beautiful morning! LTC Walter Paul, USA Ret (President, Albuquerque Chapter, MOAA) welcomed everyone & lead Pledge of Allegiance. Chaplain Gregory Brunson gave opening prayer & Memorial Address. COL Roger Knight read names of deceased. A buglar from 47th NM Regiment played TAPS, which was followed by a Bagpipe Lament (Mike Henry & Molly Kearney). A Social with refreshments followed the Memorial. Created on 26/04/16, last changed on 26/04/16. 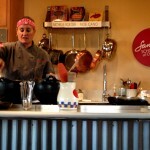 Our SF School of Cooking demonstration with Brunch was outstanding - Chef Michelle Roetzer was both educational & entertaining! There were 36 participants who really enjoyed the class as well as the food. We also visited the Spanish Colonial Art Museum where were had great docent-lead tours (one docent was Kay Lewis, a MOAA member). The newly built SF Botanical Gardens were also explained by docents. Monarch was a new adventure planned by Ron Salley & Jackie Sommers. We stayed at the Days Inn in Salida. Skiing Monarch Ski Area was great fun with wonderful snow conditions & beautiful views, enjoyed by 35 participants. It's a definitely a trip that should be repeated. Created on 27/04/16, last changed on 27/04/16. 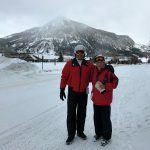 50 participants enjoyed 3 days of great skiing (snowy 1st & 3rd days, sunny 2nd day) at Crested Butte, CO, with lodging at Old Town Inn. 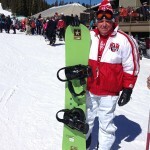 It was another fun ski trip planned by Reg Rider & Jim Eddings. 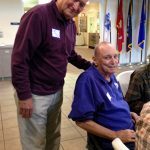 About 45 participants enjoyed socializing with good food & beverages at NM Veterans Memorial. 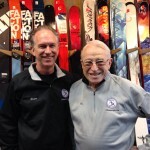 Duane Kinsley gave a talk on new skis & boots at Sport Systems. Margaret Emrick announced she is selling wreaths for the Adaptive Ski Program. Created on 27/04/16, last changed on 25/07/16. There was a great turnout for Albuquerque Chapter, MOAA's Membership Appreciation "Beer & Brat" at the NM Veterans Memorial. In addition to Election of Officers, there were speakers explaining "Lawyers Helping Warriors" and KAFB Benefits. Roger presented donations from MOAA to Gold & Blue Star Mothers and NM Integration Center. Service plaques were presented to Karen & Rett. 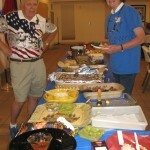 Thanks to Chuck & his helpers, we all enjoyed delicious brats, Italian sausages, side dishes & dessert. 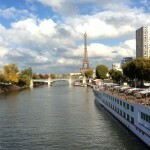 Cruising on the Seine, Saone and Rhone Rivers, we visited, Paris, Vernon, Rouen, Normandy Beaches, Les Andelys, Dijon, Beaune, Lyon, Vienne, Tornon, Arles, & Avignon. Except for a few rainy days, it was a wonderful trip with great sights. This 2-day motorcoach trip spent night at Red Lion Hotel in Farmington. 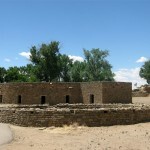 On Friday, sights included Aztec Ruins National Monument, Farmington Museum, a BBQ Dinner & a wonderful performance of "Footloose" at Lions Wilderness Park. On Saturday, we enjoyed seeing Bolack Ranch's incredible Fish & Wildlife Museum and time for a stroll along Farmington's River Walk to see their Veterans Memorial. After a delicious lunch at Zebadiah's, we stopped briefly at the Bisti Badlands on our return back to Albuquerque. A fun adventure enjoyed by 37 participants. We especially enjoyed the waterfalls and beautiful sights at both parks! Our stay at Wonder Valley Resort included all meals, hosted happy hours, cowboy entertainment, hayride & wonderful accommodations. The drive down the California coast (Highway 1) was another beautiful sight. Our stay at the Cavalier Oceanfront Resort was a nice surprise, just a short walk to the ocean! This MOAA Tour included coach transportation; 1 overnight Golden Nugget Hotel in Downtown Las Vegas, NV (with Fremont Street Experience); 2 nights in Furnace Creek Resort, CA; and 1 night at Golden Nugget Hotel in Laughlin, NV. 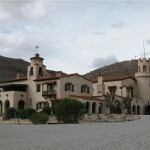 It also included guided tour of Scotty’s Castle and all-day step-on guided tour of Death Valley National Park. The weather was perfect & 39 participants had a great time! 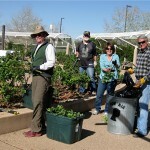 Every month, usually 3rd Mondays, about 8-10 MOAA members come to the NM Veterans Memorial to trim roses & other bushes plus help to clean up the Grounds. This worth-while project is headed up by Chuck Wood. COL Roger Mickelson, USA (Ret), President of the Albuquerque Chapter, MOAA presented the Manzano High School, Navy Junior Reserve Officer Training Corps with a check for $500. 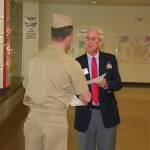 Receiving the check is Major Bill Barker, District Military Instructor, Mr. Ken Tuley, Cadet Ensign Jonethan Cleaver and Commander Mike Beno, NJROTC, Senior Naval Science Instructor. Created on 28/04/16, last changed on 28/04/16. 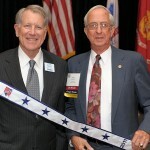 MOAA Chairman Steve Abbott (ADM, USN, Retired) presents the Five Star Chapter Award to Albuquerque Chapter President Roger Mickelson, who accepted it on behalf of the diligent, dedicated, and hard-working Board and Chapter members who truly earned this prestigious award.